On June 26th, 2010, I had the sad misfortune to have to put my best friend to sleep. 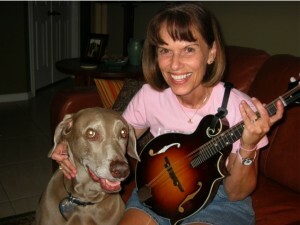 Gretzky is my pet weimaraner and my best friend for 11 and 1/2 years. This past month Gretzky became ill and headed to the music studio in the sky. So why am I writing about him on my own music website and blog? Well, Gretzky was more than just a pet and best friend. He performed an integral function as part of Fretmentor’s business. He was Fretmentor’s business partner, cover model, finance manager and audience. He modeled the apparel. He collected and even on some occasions ate the lesson fees. Gretzky entertained the students. 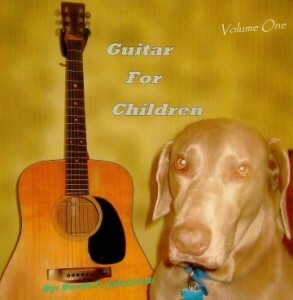 In addition, he is the cover star featured on Fretmentor’s Children Guitar instructional book on CD and the children would be curious to learn more about him. Many of my students became acquainted with Gretzky when they arrived for their lessons. He had many favorite students and knew which day they would arrive with treats. He would wait for their arrival and greet them at the door. He also let them know when their hour lesson was over. On at least one occasion, Gretzky grabbed the lesson fees and swallowed a portion of a $20 bill (he disregarded the singles) If a student wasn’t careful and left their case open, he would steal a guitar, mandolin or banjo polishing cloth. He came back with it just to show you that he could do it if and when he wanted to. Yet, he freely returned the rag to its rightful owner. When I recorded music, I sometimes forgot that Gretzky would walk in just as the recording was finishing. Upon review, you could hear Gretzky’s collar jingling in between the instrumental breaks. So that so-called perfect recording had to be recorded over. 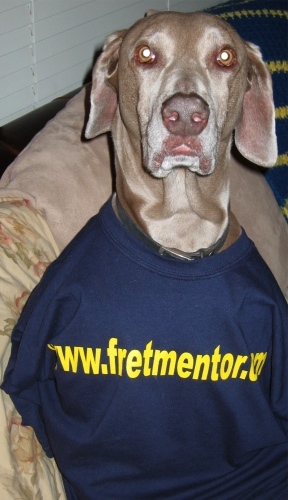 So it was a sad month as we lost a key member of the Fretmentor community. I will miss my best friend dearly but he will never be forgotten. When it is time for me to leave this earth, I look forward to playing my guitar, banjo, or mandolin once again with Gretzky by my side. This entry was posted in Fretmentor News, Uncategorized and tagged fretmentor. Bookmark the permalink. Once again I shed a tear for Gretzky! We had him on loan for a little while but God wanted him back. I know he’s waiting for his best friend to join him (Fretmentor), but in the meantime I’m sure he’s barking and running and enjoying peanut butter treats! He truly was an awesome dog! Gretzky(The Great One) must have been an awesome being in his last life because he was sure with a great person in this life. 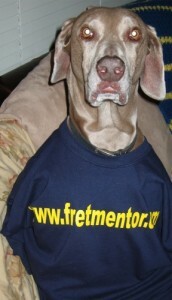 Fretmentor and Gretz deserved each other and I believe Gretzky is keeping Fret’s place in Heaven warm. I miss him and will always remember him. Be gentle with yourself as you grieve…..and don’t let anyone tell you..”It was just a dog”. I never met Gretzky, but I have lost an old (dog) friend too, and know how hard it can be. Since I presently have 5 dogs the anyone who says “it was just a dog” is obviously doesn’t know the best things in life. Gretzky is part of my great dogs I have known. My brothers Shepherd I loved to play catch with and all mine that are here and gone that just liked to snuggle and give unconditional love. People who never get another dog because the pain of the loss also never recieve all the joy. Gretzky was one smart cookie and will be missed. I was glad that I was able to advise you during Gretzky’s last days and help translate what your veterinarian was telling you. I knew it was really bad news right away, and that it was just a matter of time. Seeing Gretzky twice a week and bringing him treats was certainly among the high points of my weeks since we started back last year. 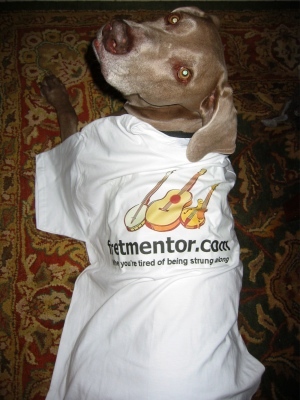 When I told my son about his passing (he also takes lessons with Fretmentor) he remembered that when I started lessons (before he did) I came home and told him that Dave had one of the best and coolest dogs I’d ever known. And I’ve known a LOT of them. I wished many times that Gretz could meet MY dog and maybe some of his personality would rub of on my Nellie, who has some personality “shortcomings” compared to Gretzky. See you around, old boy! It was a fun ride.